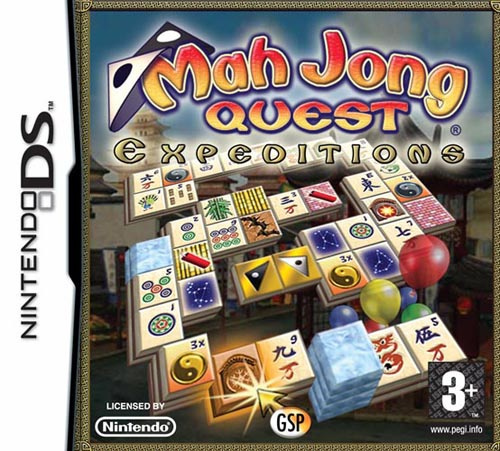 Let's get something out of the way right now: Mahjong Quest Expeditions has nothing to do with the game of mahjong (a four-player game more akin to gin rummy or poker): it's a solitaire game which is played using the same tiles and there the similarities end. Nevertheless it can be a fun diversion and the fact that it's appeared in some form on nearly every computer, console and handheld made going all the way back to the 1981 PLATO mainframe at the University of Illinois speaks volumes about its enduring popularity. With a pedigree like that you'd think that every mahjong solitaire game would be the same, but you'd be wrong. This DS release not only includes a lot of traditional match-two action, but introduces new twists that will challenge even veteran players, all wrapped up in a nice-looking package. Whilst this review is of the standalone PAL release, the same game is included along with a couple of other "Quest" games in the same series, in the form of the Quest Trio in North America. Mahjong solitaire (or taipei, or shanghai or whatever other name you want to call it) is pretty simple: tiles are stacked up three-dimensionally and need to be removed in pairs with the goal being to clear all tiles from the playfield. This is complicated by the fact that a mahjong set includes four of each tile and they may only be removed if at least one side (left or right) isn't touching another tile and there are no tiles resting on their upper surfaces. There are three main game modes on offer: Classic, Kwazi's Quest and Puzzle. Classic is the game fans will be familiar with: you have to clear the tiles from 32 patterns divided according to difficulty, with your best time and highest score being recorded against your profile (there's a few profiles available for households with multiple players). You can also use variant rules like only revealing tiles which can be matched, scrambling tiles every 10 seconds, only revealing tile values when moving the cursor over the tiles or unselectable tiles being identified by suit only. 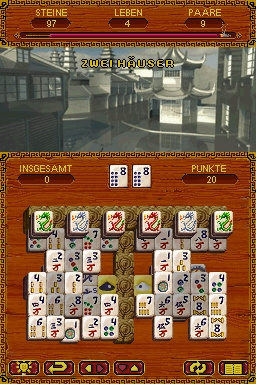 Puzzle mode uses the same special tiles and has the same goal as Kwazi's Quest (matching two special tiles rather than clearing the whole board), but offers a different selection of patterns and includes the same rules variants as the Classic game. 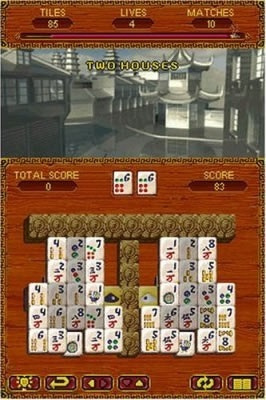 Kwazi's Quest is the main game mode: progress through eight "lands" of eight boards each, with the goal being to complete all 64 and "return balance to the world." Kwazi's Quest just looks like progressive mahjong solitaire, but quickly reveals itself to be something a bit different. You'll still be matching tiles and trying to clear the board, but rather than removing all tiles you're actually trying to remove two special tiles buried at the bottom of the pattern within the time limit. 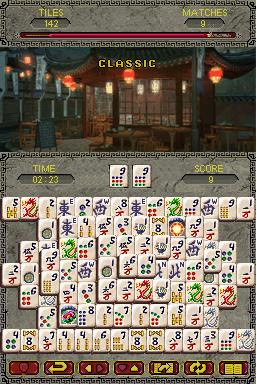 New special tiles are incorporated into the standard mahjong set which have different effects like extending time or destroying different kinds of blocking tiles. There are also tiles that will allow you to swap two tiles, change one type into another or remove that type from play. Whilst these tiles can make completing the boards the feature in easy, they're counter-balanced by some rather extreme challenges like boards which have more than four of each tile which you must match in triples rather than pairs or by doubling the number of tiles so that there are now eight of each tile rather than two making clearing all 298(!) rather difficult. The final eight boards are the toughest mahjong solitaire games we've yet to come across, but rest assured that all are solvable. You'll only be able to shuffle tiles if you run out of time, so if you get stuck you might want to try one of the other game modes to avoid getting too discouraged during the Quest. You have a limited number of lives to play Kwazi's Quest and you'll lose them if you end up blocked and unable to solve the board or run out of time, though the only penalty for running out is losing your score. Since we couldn't see any evidence that it was recorded (unlike the Classic or Puzzle modes) we're not really sure why this mode even has one. You'll also need to pay attention when special tiles are initially described because there doesn't seem to be any in-game guide to what they do and it's not always obvious from looking at them. The user interface is quite good and you can play the whole game with the stylus alone, using icons that allow you to flip the board horizontally or vertically to ensure your play isn't hampered by perspective. If you want to use digital controls you simply start pressing buttons or using the d-pad and that method of control will be enabled dynamically. Of course a barebones presentation would have been expected for a license-free board game like this, but we were pleasantly surprised to find the use of cute interstitials featuring male and female characters breaking through the walls between lands (their yin-yang hats are the special tiles you need to match to clear the board). Each board completion results in the artwork in the upper screen for each land being enhanced until you've got a finished landscape to appreciate along with a pithy piece of Eastern philosophy to read at the end of each land. There's also a decent number of musical tracks which sound like Chinese classical and are fittingly atmospheric. The sound of the tiles falling into place as they flow out of the character's hats at start of each board sound more like playing cards to us, but is still pleasing as are other sound effects. We would have liked options for different backgrounds and tile facings we've come to expect from playing Sunsoft's Shanghai series and local multiplayer would have been nice to see, but for fans of mahjong solitaire there's no question this title packs in plenty of value and you'll get a lot out of it. 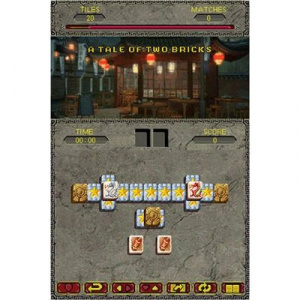 Though Mahjong Quest Expeditions could have been a bog-standard assortment of classic shanghai patterns, developer iWin.com have done a good job of building upon the core gameplay to offer new challenges; wrapping it all up in a pleasing package. I'm lucky enough to have this as part of my "Quest Trio" cart along with Jewel Quest Expeditions and Jewel Quest Solitaire. They all come on one kart (had to import from NA of course!). THIS game is my favourite. I totally agree with the revw and have to say its the best video game incarnation off Mahjong out there along with Word Jong. Recommended even if you have a passing interest in Mahjong. The revw pretty much capture the essence and gameplay to a good degree, I don't think I could add anything more, lol. Good revw! Ooh, my mom likes Mahjong. Maybe I'll get this her on Mother's Day. I got this as part of the Quest Trio cart and if you like this type of Mahjong it is definitely worth getting. It can usually be found for about $20. I have completed every board except the last one, which is a real stinker. I will beat it yet. Sounds great! I used to play some Mahjong like this online a lot, and it was quite fun. Maybe I'll check into it!